So much is happening on Valentine’s Day: people loving one another, chocolate comas, flowers being cut and put in vases, and I am standing in rain soaking myself to the bone. Kicking myself for not wearing the raincoat my mom gifted me, I stand in front of an arts and cultural center called Baker Hunt. I am motivated to leave the rain by the promise of great conversation with Kelsey Nihiser, education program director for Baker Hunt. Following a brick path, I enter the side door of an off-white renovated home, now studio and museum. I immediately feel a welcoming energy I can’t quite explain, and wander my way to Kelsey’s cozy office. Valentine’s Day temporary tattoos are littering the desk she walks around to greet me with a smile. She sits down and I slump into her “grandpa” reading chair. The room is pasted with grids of schedules and class times for the 4,900 annual students who enroll every season. Kelsey begins to explain her role at Baker Hunt: finding art teachers, scheduling classes, taking classes, and investing in the expansion of “creative dabbling” for all ages. She is part of a small team of five members that make sure the legacy of Margaretta Baker Hunt carries on. Kelsey is actively helping students expand what art can be by introducing new classes to Baker Hunt for students of any age. I was lucky to engage with the wide range of students as I watched adults in higher level classes like advanced oils painting and children handbuilding with clay. Baker Hunt is a hidden gem, tucked in between homes and businesses, thriving since 1922. Margaretta and her niece Kate Scudder started the center to foster the creative minds that needed more than minutes in an art classroom once a week. I am humbled to see Kelsey radiating passion for this mission. 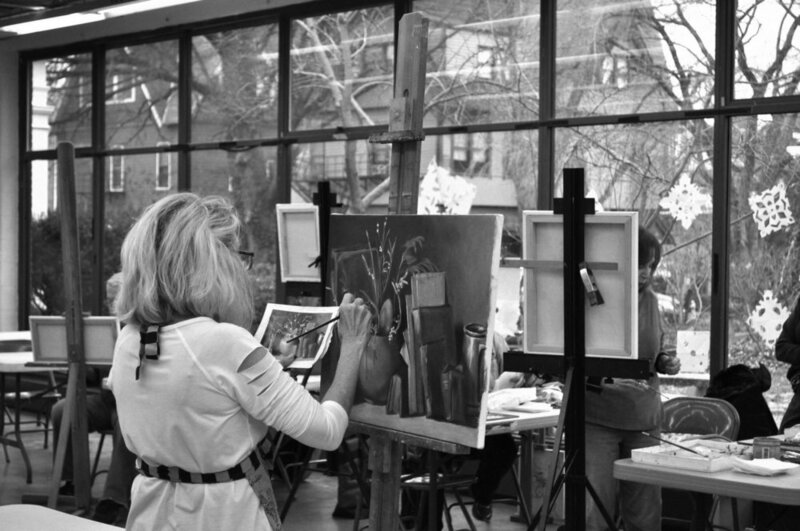 In the 96 years Baker Hunt has been established, classes like painting, ceramics, film, drawing, and quilting have been offered to students looking to learn more about the arts. With the help of Kelsey and the interests of the 40 to 45 annual teachers, new classes like Tai Chi, belly dancing, and yoga have been introduced. The list is endless, and always changing with new class proposals being drawn up by active teachers with bright ideas. As I rush to scribble all of this down, Kelsey tells me about the 32 current scholarships offered to students that may not have an outlet at their local schools to practice art and creative thinking. With special programming and outreach to local schools, they are able to spread the word about what they offer on their Covington campus. Baker Hunt is spreading roots, literally, by working with local farmers markets and garden experts to expand their community garden and so much more. I can’t stop smiling as we discuss the benefits of a supportive creative community in the city. With the amount of artists moving to Cincinnati, the promise of educating the youth and watering the minds of those that left the arts for the “real world” is getting louder and more clear. I am so touched by the vulnerability and flexibility Baker Hunt offers for personal growth. As Kelsey and I bond over the potential of students and continuous learners that Baker Hunt serves, my heart feels full. I remember the struggle of finding myself in the midst of required math and science classes, looking forward to my 50 minutes of art. Kelsey and I talk about how hard it was for our parents to understand what it meant to invest in our love for the arts. For many students, art is something they may experience once a month for most of their education, and maybe they never get to express their view on what goes on around them. The ability to express yourself with colors, music, and movement is so crucial, and important for everyone to have an equal opportunity to create. I think Baker Hunt is pushing what it means to nurture self-expression in all of the ways I can think of, and so much more. I mean, the campus was started by two women, in a time when women were not given much of an opportunity to speak up for what they loved; that is strength. That strength is still present as adults enroll for personal growth and engage in new things that may seem daunting. I feel lighter than ever as Kelsey takes me on a tour of the campus. I witness children at play with simple, colorful material in the first studio, and pottery wheels in the next. We make our way to the lower level and I see a sculpture piece hanging from the ceiling, inspired by the glassblower, Dale Chihuly, and made from recycled water bottles. All the while, I realize my wildest dream of every human being experiencing art may not be so wild. Interested in taking classes at Baker Hunt? Check out their spring schedules.